The Islamic Jihad, or as it is officially called The Islamic Jihad Movement in Palestine, is a radical Muslim terror organization operating in the Middle East. The organization's main goal is the elimination of Israel, which it calls "the Zionist entity", through Jihad – a holy war, and the establishment of an Islamic state "from sea to sea." The Islamic Jihad's charter further calls for "Jihad against the Jewish existence in Palestine," and states that "the Jihad is the obligation of every Muslim and must be carried out immediately, regardless of the formation of an Islamic state." The holy war, continues the charter, is a vital step in rehabilitating the Islamic nation and will lead the nation back to its fundamental, original, Islamic values. The Islamic Jihad is a significantly smaller organization than Hamas. Like Hamas, the Jihad's principles derive from those of the Muslim Brotherhood, but unlike it, it has no civil branch, nor does it work to benefit the Palestinian people; its main focus is on guerrilla warfare and terror activities. The Islamic Jihad has large cells in various Arab nations. Financed almost exclusively by Iran, the organization's leadership is located in Syria. Iran is said to funnel several million dollars a year to the Jihad, with nearly all funds going directly to terror activities, and some towards the organization's bureaucracy, maintaining offices, salaries, weapon purchases and aiding its members' families. The Palestinian Islamic Jihad was founded by Fathi Shaqaqi and Abd al-Aziz Awda in the 1970s, as a branch of the Egyptian Islamic Jihad. In the early 1980s the two returned to Gaza and began recruiting men and funds, mostly through mosques and other religious establishments. The Jihad's Palestinian cell, known as the al-Quds Brigades, is said to have several hundred operatives, located mostly in Gaza. Soon after establishing itself in the Palestinian territories, the Jihad began training its men in guerrilla warfare, later becoming a driving force in the eruption of the First Intifada, in 1987. In 1988, after a series of terror attack on Israeli citizens and IDF forces, Israel outlawed the Islamic Jihad, subsequently exiling Shaqaqi to Lebanon. Many of the Jihad's local leaders fled Israel, settling in Syria and Lebanon, where they tightened their ties with Iran and Syria and formed tactical bonds with other radical terror groups such as Hizbullah. The PLO's (Palestine Liberation Organization) recognition of Israel's right to exist in 1988 and the subsequent signing of the Oslo Accords in 1993, were seen by the Jihad as acts of treason, prompting the organization to escalate its attacks on Israel. Dozens of suicide bombings swept through the country, as Jihad "shahids" (martyrs) targeted Israeli buses, restaurants and public venues. In one of the Jihad's most infamous attacks in 1995, two suicide bombers targeted a group of soldiers at a northern bus depot; the first bomber killing soldiers and the second slaying the emergency services' personnel who rushed to the scene. Twenty-two Israelis lost their lives that morning. On October 1995 Fathi Shaqaqi was assassinated in Malta by two bikers who shot him at pointblank range. The international intelligence community has always maintained the Mossad was responsible for the hit, but Israel never claimed it for its own. Shaqaqi's place in Jihad's leadership was taken by one of his deputies, Dr. Ramadan Abdullah Shallah, who still heads the organization from his hiding place in Damascus. Abdullah makes no secret of Iran's involvement in Islamic Jihad activities: "The Palestinian Islamic Jihad is another fruit of the Ayatollah Khomeini's fructuous tree," he said during a 2002 visit to Tehran. On March 1996, the Jihad managed to smuggle a suicide bomber through Gaza's Karni crossing, which is used mainly for industrial shippings, into Israel. He later blew himself up in Tel Aviv, during a Purim (Jewish Halloween) holiday parade, killing 13 and injuring 125. When the Second Intifada erupted in 2000, Jihad once again escalated its terror activities, going as far as joining forces with Hamas, for the first time in both groups' history, in an attempt to carry out even bigger, more ferocious attacks on Israel. The Jihad made terror history at that time, allowing women into its ranks and training them, alongside its men, to carry out attacks. The Jihad soon flaunted the novelty: On October 4 2003, a female suicide bomber targeted the Maxim Restaurant in Haifa, killing 21 Israelis. The Jihad went on to claim hundreds of attacks on Israel, carrying out some 422 bombings, shootings and stabbings, in which 134 Israelis were killed and approximately 880 were injured. The Palestinian Authority, meanwhile, was going through some major political changes: In late 2004 Yasser Arafat died. In early 2005, Mahmoud Abbas was named Palestinian president and the following summer saw Israel unilaterally withdraw from the Gaza Strip. In January 2006, the PA held its first general elections in which Hamas achieved a landslide victory, winning 76 of the Palestinian parliament's 132 seats. 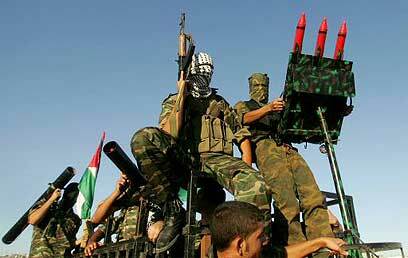 Hamas-Fatah infighting began shortly after, escalating over the course of a year to the point of a near-civil war. In mid 2007 Hamas forces took control of the Gaza Strip, forcing Palestinian leadership, including Abbas, to flee to the West Bank city of Ramallah, effectively splitting the PA into two political entities. Throughout the political turmoil The Islamic Jihad continued its attacks on Israel: Stealthily aided by Hamas – which chose not to be directly involved at the time – Jihad operatives escalated the barrage of Qassam rockets and mortar shells fired at Israel's southwest. The Jihad's Qassam and mortars are short-range rockets, allowing the organization to target mostly Sderot, the Sha'ar Hanegev Regional Council and the Gaza vicinity communities. 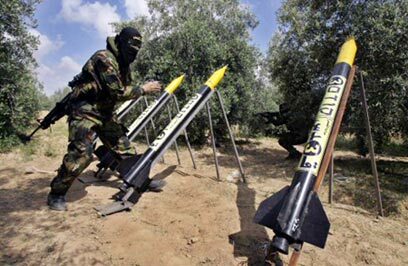 Jihad forces have also tried using self-produced mid-range rockets called "Quds 101," "Quds 102," and "Quds 103" aimed at Ashkelon. Being of a-political nature, the Islamic Jihad is not obligated by any hudna or ceasefire – temporary of permanent – brokered between Hamas and Israel. The Islamic Jihad is defined as a terror group by the United States, the European Union, the United Kingdom, Japan, Canada, Australia and Israel. Fathi Shaqaqi: Co-founder of the Islamic Jihad, killed in Malta in 1995. Dr. Ramadan Abdullah Shallah: Current leader of the Jihad, who took over after Shaqaqi's death, currently living in Syria. Dr. Sami Al-Arian: The North American leader of the Islamic Jihad, responsible for raising funds for the organization's terror activities. He was arrested in 2003 and later indicted by the US attorney general for 50 counts of operating a racketeering enterprise and supporting terror acts. He pled guilty to charges of conspiracy to help members of the Palestinian Islamic Jihad in nonviolent activities and sentenced to 57 months in prison. He stands to be deported from the US upon completion of his sentence. Abdullah al-Shami: The Gaza leader of Islamic Jihad. Mohammed el-Hindi: One of the organization's senior leaders in Gaza, considered a radical hardliner. Mahmoud Tawalbe: Leader of the Jihad's military forces in the West Bank city of Jenin. ; killed by IDF forces during Operation Defensive Shield in 2002. Sheikh Mohammed Khalil: A senior Jihad operative, killed in an IAF airstrike in Gaza in 2005. Bashir Dabash: Head of the military arm of the Islamic Jihad in Gaza, killed by IDF forces in 2004. Louie Saadi: Head of the military arm of the Islamic Jihad in the West Bank; was one of the IDF's most wanted operatives in the West Bank. Killed by IDF forces in 2005. Issa Battat: Head of Islamic Jihad military wing in Bethlehem; arrested by IDF forces in 2003. Mohammed Dadouh: Senior Jihad commander in Gaza, killed by IDF forces in 2006.